I am just so completely in love with Mirka and entranced by Hereville that, after checking out Hereville.com and discovering that Barry Deutsch looks like a pretty friendly guy, I sent him some fan mail. He is a very friendly guy AND he agreed to answer a few of my questions about his amazing first graphic novel! Also, at the end of the interview Barry recommends graphic novels and webcomics that he (and some young listeners) are currently enjoying with links to all. A sheynem dank, Barry! Obvious first question: Why an Orthodox Jewish girl? Why not an Orthodox Jewish girl? A decade or more before I created Hereville, I read the book Holy Days, by Lis Harris, which includes a lot about the daily life of a Hasidic Jewish family. I read that and thought it was fascinating -- an entire society, embedded in modern-day society but in many ways so separate and distinct. When I create a comic, my imagined audience is always me -- "what would I find interesting to read about"? Since I found that society so interesting to read about, it was natural for me to put it in a comic someday. I'm not sure why a girl, as opposed to a boy. But I've always liked writing and reading about female characters. Plus, it's always nice to be doing something that not everyone else is doing. There's not exactly a huge number of fantasy adventure comic books about 11-year-old Jewish girls out there! So true! That makes the tagline for the book all the more brilliant and funny. As someone who knows almost nothing about the religion, I have to admit that setting your graphic novel in an Orthodox Jewish community was almost as foreign as setting a book at a school for wizards. Because of this, I think that the appearance of magic and magical creatures is almost even more of a surprise and delight. Did you know from the start that your book would have elements of fantasy in it? How did you decide what magical aspects to include? I always intended for Mirka's story to include magical, fairy-tale elements; I never even considered another approach. As for which magical elements to include, sometime after I started, I got the image of the big battle at the climax of the book -- without giving away spoilers, I'm talking about the two double-page spreads in which Mirka has an unexpected duel. Once I knew she was going to be having the duel, I could work my way out from there -- who was she fighting? What kind of a monster would have the right personality to fight her in that fashion? How would she get into that situation? And eventually the story is pieced together that way. Wow! That is so interesting to know that you envisioned the climax at an early point in your writing of the story. But it all fits - the climax is perfect and brings all the threads together, no pun intended. Mirka has to be my favorite new heroine of 2010. While I loved the plot of your book, I really just enjoyed following Mirka throughout her days. She is brave, a little bit impulsive, smart, thinks outside of the box, doesn't give up, loves her family and follows her passion. Frankly, I'm a little bit put out that a GUY created such a cool girl character. How the heck did you do it??? Thanks! I'm glad you like Mirka. I like her a lot, too. This is something I talk about when I do my Hereville slideshow. :-) I just don't see it as a big problem. Mirka has a lot of differences from me -- she's a girl, I'm a boy, she's devout, I'm atheist, she's brave, I'm a big wimp. But we also have so much in common. She gets afraid, she loves her family, she sometimes acts badly, she doesn't fit into the gender role people expect of her, and she's got this big dream that really doesn't seem very practical. Those are all things I have in common in Mirka, that I can draw on to tell her story. Good point - we all have similarities and differences that come out the same in the end, sometimes. I think, though, that as a female, I am still used to boys ruling the pages of adventure stories, so that makes Mirka all the more wonderous to me. I have to say, I really came to love Fruma as well. I love books where a young adventurer also has a wise, strong adult figure to turn to, and Fruma is definitely that, even if her arguing does seem exasperating. Can you tell us how/why did Fruma made it into your story (without giving too much about her past away - clues seem to indicate that she has some secrets to divulge to Mirka at some point...)? Originally, I was just playing with the fairy tale trope. There are so many fairy tales with an evil stepmother, so I thought it would be fun to include a stepmother who was conventionally unattractive and sometimes aggravating to Mirka -- but who was nonetheless a really positive character who readers would like. And there is a lot more for Mirka, and the readers, to learn about Fruma's past. I won't be getting into that in the next Hereville book, but I do plan to reveal at least some of Fruma's secrets someday. Well, you did a great job of twisting the trope! I have to admit, even after two readings I didn't fully catch this until I read Betsy Bird's review of Hereville at School Library Journal back in August, but I love the way that Mirka gets her sword and how much it has to do with Fruma, who is always trying to teach her domestic arts and in the end teaches her the intellectual art of the argument. You said that you worked out the climax early on in the process, but did you have this all figured out as well? It just developed! I certainly knew how I'd end the book well before I got around to drawing the ending; but when I originally drew page 4, where Fruma is arguing with Mirka about dragons, I had no idea how key that page would be to the story. What is it about arguing? It is a great theme in your book but one that I have to admit I don't see too often (unless it is in the sassy, annoying kid way) in kid's books. Arguing is a very Jewish thing. In the Talmud -- as Wikipedia puts it, the Talmud is "a central text of mainstream Judaism" -- a great deal of time is spent with a form of argument in which the rabbis examine questions from every possible side of an issue. It's like the old Jewish saying, where there are two Jews there are at least three opinions. For me personally, I've always enjoyed argument, and was on the debate team in college. That shows in your book! I know that Hereville (like Diary of a Wimpy Kid, among many others) was originally a webcomic. Can you tell those of who have no idea what one is, how does a webcomic work? Where do you post it, who can see it, how do you draw it? A webcomic is just like a regular comic book or comic strip, except instead of being printed on paper you can view it on the web. They're just posted on websites, like any other content on the web, and anyone interested can view them. But because there are almost no barriers to publishing on the web, many more comics get published on the web then get published on paper. As you'd expect, many webcomics aren't very good, but there are some webcomics that are just wonderful. If your readers are interested, they can find a list of just some of the webcomics I enjoy at http://www.hereville.com/links/ . As for how you draw webcomics, you draw them the same way you'd draw any comic. Some webcomics are drawn on paper and then scanned; some regular comics, like Hereville, are drawn on computer and then printed on paper. As time goes on, the distinction between webcomics and paper comics has become fuzzier and fuzzier, because so many comics are published both ways. How is the webcomic of Hereville different from the book? The illustrations for the webcomic look a bit rougher that the book. How did you decide what to change and keep the same? Did you work with an editor at Abrams? The webcomic and the book both end the same way, with only small differences. But there are big differences in the story leading up the ending -- the new book has many new characters, such as the pig, and Mirka's sisters Gittel and Rochel. And even where the story is similar, I redrew all but the last 25 or so pages, because over the five years I drew the webcomic my drawing style changed a lot. Overall, the graphic novel has over 100 pages that are either new or redrawn since the webcomic. When I started Hereville, I had very little idea where I was going, and made it up as I went along. But while I was doing that, I was also doing a lot of research about daily life in a Hasidic community, and also discovering the story. So by the time I reached the ending, I could see a lot that I wanted to change -- things like having Mirka come from a large family, instead of a small family, because Hasidic families are often pretty large. I did work with an editor at Abrams, Sheila Keenan, who is fabulous and cares almost as much about Hereville as I do. She and I had a lot of long arguments about things, but it improved the book in the end, which is what matters. Wow! I did notice differences in style between the webcomic and the book. The arguments paid off! I really appreciated the watching the video of you drawing a page of Hereville. For thos of us who know nothing, can you talk a bit about how drawing on a computer works and why do comic book artists work with another person who adds the colors - Jake Richmond in the case of Hereville? I draw on the computer using a device called a "Cintiq," which is a special monitor you can draw on with a special pen, just like you'd draw on a piece of paper. (You can search Youtube for "cintiq" to see videos of the Cintiq in action.) (Or watch the above clip of Barry drawing!) So the physical act of drawing is very similar, on computer or on paper. The big difference is with a computer, you have a lot more ability to edit your drawing once you've made it. Why do comic book artists sometimes use colorists? Mainly, as a way of speeding up production! It takes a really long time to make comic book pages, and splitting up the work is one way of speeding that up. That said, Jake did a wonderful job coloring Hereville, and I loved sometimes being surprised by the choices he made (which were often better than the choices I would have made). One last thing, I know that Will Eisner, father of the Graphic Novel, was your instructor while you were at the School of Visual Arts in NYC. What graphic novels to you love to read? And, for those of use new to graphic novels, can you give us a few directions to read in - for both kids and adults? There are way too many to list! But some of my favorites include almost anything by Jamie Hernandez , Stuck Rubber Baby by Howard Cruise, Castle Waiting (review with sample pages) by Linda Medley, and George Sprott by Seth. (No last name, just "Seth"). And about a zillion others. Online my two favorite ongoing graphic novel-style webcomics are Family Man by Dylan Meconis, and Dicebox by Jenn Manley Lee. And, for those of use new to graphic novels, can you give us a few directions to read in - for both kids and adults? 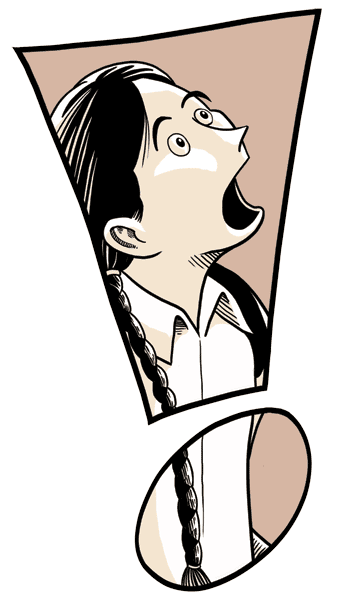 Well, for anyone interested reading about the comics medium, Scott McCloud's "Understanding Comics" is a must-read, and folks who want to create comics should also read his follow-up "Making Comics." Those are not only great books about comics, they're great comics themselves. And of course, I'd recommend comic strip collections: Anyone of any age would love Peanuts, Pogo, and Calvin and Hobbes! Finally, what kid's books left an impression on you as a child and do you still read kid's books, and if yes, which ones? I was obsessed with Pogo a a kid, and re-read the collections I had a bunch of times. I also remember loving Harold and the Purple Crayon. As a slightly older kid, I still read Pogo, and also loved the Great Brain series of books by John Dennis Fitzgerald, which had great illustrations by Mercer Mayer that I can still picture! Other novels I reread about a thousand times as a kid included The Pushcart War by Jean Merrill, The Hobbit by Tolkien, The Golden Key by George Macdonald (the edition I read had stunning illustrations by Maurice Sendak) and A Wrinkle In Time by by Madeleine L'Engle. And of course I read endless comic books! I really loved superheroes back then -- my favorite was Spiderman, which at the time was written by Roger Stern and drawn by John Romita Jr. Most kid books I read nowadays are graphic novels. The two most recent I've read are The Popularity Papers by Amy Ignatow (review at books4yourkids), and Crogan's March by Chris Schweizer, both of which were terrific. I think I might be one of the only adult men who's ever read The Popularity Papers, but it was really funny! As far as prose goes, I recently read an advanced copy of Lauren Myracle's Shine, which I really enjoyed, and I'm currently in the middle of Eishes Chayil's Hush, (review at the blog Velveteen Rabbi) which so far is both amazing and heartbreaking. I LOVED The Popularity Papers, which I reviewed (after avoiding for a long time because of the title) last August. Amy Ignatow is amazing! You may be the only grown man (who is not a librarian) to have read it... Lauren Myracle is great and Hush looks incredible. I'm going to try to get my hands on that books. All the books you mentioned as influences and current reads are spectacular! You have a great literary canon to draw from. Thanks so much for taking the time to fill us in on how Mirka and Hereville came to be. Can you give us any little tidbits about what to expect from Mirka and you in the future? Abrams has asked me to do two more Hereville books (and if these do well, I hope there will be many more Hereville books after that!). In each book, Mirka will be a little older, and eventually we get to see what Mirka's like as a young adult. For the next book, though, Mirka's only a little bit older. One of her older sisters is getting married, and that gives Mirka a lot to deal with -- plus, of course, there's monsters and magic things happening. I'm just getting started on this story, but I think it'll be a lot of fun. Excellent! I can't wait to see where Mirka and her family are headed! I just wish I didn't have to wait a year or more!! Thanks again for taking the time to share with me and my readers!